Experiencing Los Angeles: How Many Major U.S. Cities Can Fit Inside Los Angeles City Limits? 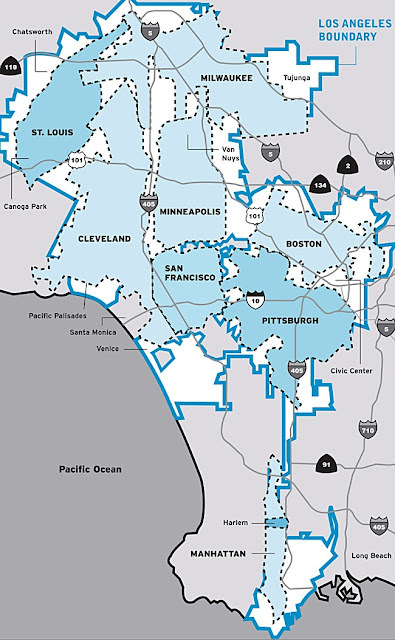 How Many Major U.S. Cities Can Fit Inside Los Angeles City Limits? The City of Los Angeles is MASSIVE, encompassing 469 square miles This is not to be confused with Los Angeles County - which covers a mind boggling 4,083 square miles. Here's a previous post explaining the difference. I recently came across this incredible image, illustrating the number of cities that could fit inside the city limits of Los Angeles. Listed is St. Louis, Milwaukee, Cleveland, Minneapolis, Boston, San Franciso, Pittsburg ... and Manhattan. Here's a link to the original article.